Bulk mail advertising is very widespread. Virtually every home and business in the United States receives a huge amount of advertising literature. This may come in the form of product catalogs, color postcards, folded brochures, inserts or any other format that the advertising world can dream of. Unusual shapes and formats are often used in order to capture the reader’s attention. There are a significant number of postal regulations that must be followed for this type of mail. Postal fees are closely tied to the weight of the advertising piece. Of course the address, return address, and the postal permit information must all be in the correct place, and the correct size. In order to take advantage of lower postal rates, the advertiser will often arrange for some type of bulk mail permit. There are postal requirements for these reduced rates, including bundling similar postal codes together, along with the appropriate information as to the number of pieces in the bundle. The exact number of items within any bundle is often determined by weight. If the weight of a single piece has been accurately measured, then the total number of items in a bundle, or a stack of mail, or even a cart full of pieces may be easily calculated. Of course the scales that are used for this purpose must be very accurate, easy to use, and quite rugged. Most often, the type of scale chosen is called a Parts Counting Scale. This scale has the ability to calculate an individual piece weight of the advertising piece. The user will generally place a number of pieces on the scale platform. This is done so that small variations between any single item will be averaged together for a more accurate value. The total number of pieces will be entered using the front panel keypad of the scale. From this information, the scale will divide the weight measured on the platform to very accurately determine an average piece weight. Now, when a large bundle of pieces is placed on the platform, the scale will divide this weight with the value held in memory. The result will be the number of pieces in the bundle. Of course, the scale must have a high enough accuracy for this system to work properly. For bulk mailing purposes, the scale should be able to read to a resolution of 0.01 lb, or even better. If the sample size used to determine piece weight was ten pieces or larger, the calculated piece weight will be very accurate. Unfortunately, scales with that type of resolution may be limited in the maximum total weight that they will accept. Typical high quality bench scales have overall accuracies that will limit usable resolution to one part in 5,000. So with the example noted above, the maximum capacity of the parts counting scale may be 50 lb. While this limitation may not be a problem in most cases, whenever a larger quantity of advertising is being handled, this type of scale will cause problems. One method of dealing with this is to break down the larger quantities into smaller bundles that falls within the scale’s capacity. But this has the disadvantage of requiring more effort, and the possible introduction of user errors. Another alternative is to use a Dual Platform Parts Counting Scale. In this case, a larger capacity Platform Scale is connected into the parts counting scale. This may have a capacity of 500 lb, or even 1000 lb. The smaller scale is used, as described previously, to determine the piece weight. But now a large amount of the bulk mail may be placed on the platform scale. The total weight will now be divided by the piece weight, and the overall number of pieces will be determined. It may be necessary to subtract the weight of a bin or cart that holds the mailing pieces. If the weight is known in advance, it may be subtracted using the digital tare entry of the scale keypad. A third alternative is to use a special, higher accuracy, higher capacity parts counting scale. An example of this is the Arlyn Surface Acoustic Wave (SAW) Ultra Precision scale. 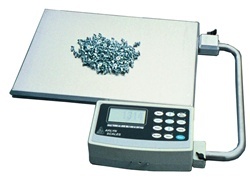 These scales have accuracies that are generally about twenty times higher than a standard parts counting scale. For example, the SAW-H has a capacity of 200 lb with an ultra precision resolution of 0.002 lb. This allows the sample piece weight to be very accurately determined. But large bulk totes of up to 200 lb can be very precisely weighed.